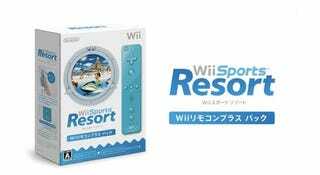 Last year, Nintendo released Wii Sports Resort, and the bundle featured the Wii MotionPlus add-on. But in 2010, Nintendo is now phasing in the Wii RemotePlus with its on-board Wii MotionPlus. What does that mean for Wii Sports Resort? A new Wii RemotePlus bundle for Wii Sports Resort. According to the game's Japanese site, it goes on sale on November 11 in The Land of the Rising Sun. The game's official US page, however, still shows the old Wii Remote. Kotaku is following up with Nintendo of America to see when the Wii RemotePlus will be bundled with Wii Sports Resort in the States.